15/1 NBA Accumulator & Double land on Sunday! Quality start to the new week here at FST as our Monday Night NBA Accumulator and Double come in! The night started in Oklahoma City where the Thunder hosted one of the best teams in the Eastern Conference the Milwaukee Bucks. We went with a safer +4 Point Spread option here on OKC and they didn’t let this one slip away! They dominated the Bucks 118-112, Paul George continued his stellar play and led them with 36 points and 8 three pointers! Chris Paul returned to the Houston Rockets line-up against the Orlando Magic. With Orlando beating the Rockets in the 1st game of the season, we went with a +12 Point Spread on the home team here. James Harden had yet another monster game with 40 points and led Houston to victory, our tip landed here as Houston won by 5 points only. Utah beat Minnesota in the 3rd game of our acca. It was a high scoring game, as it’s usually the case with the Timberwolves. Utah had 7 players score in double figures and overcame a 35 point night from Andrew Wiggins to seal the win. Not a lot of defense was played between the Spurs and Wizards. San Antonio had a total team effort in this one against Washington as 7 of their players scored in double figures to give them a 132-119 win, their 19th at home this season. And finally the Miami Heat triumphed in Dwyane Wade’s final game at Madison Square Garden agains the New York Knicks. The struggling Knicks scored only 97 points here and the heat won by 9 pts behind Wade’s 15 and 10 assists! The NBA All-Star break is just around the corner which means we are past the halfway mark of the NBA season. 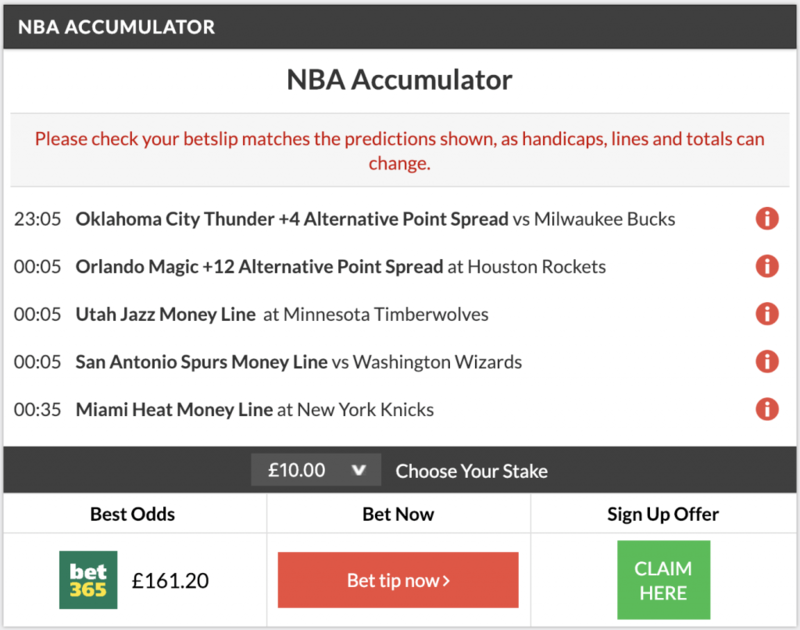 Plenty more tips, accumulators and doubles coming your way so be sure to bookmark our FREE NBA TIPS page! Categories: NBA and Tip Results. Sports: NBA.